The Reverse Sensing System is standard on the SEL and Titanium trims. This feature will look out for objects in your path while you are in reverse. When an object is detected, you will be provided with an audible alert. The beeps will become faster as you get closer to the object. The Escape also comes with a standard rearview camera that displays a crisp image of the back of the SUV on the touchscreen. 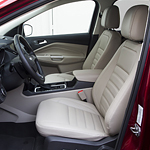 Another convenience feature that is offered with the Escape is Intelligent Access with Push Button Start. This feature is standard on the SEL, SE, and Titanium. You can use the Intelligent Access key and touch the door handle to unlock the vehicle, and all it takes is a press of the brake pedal and pushing the start button to start the engine.